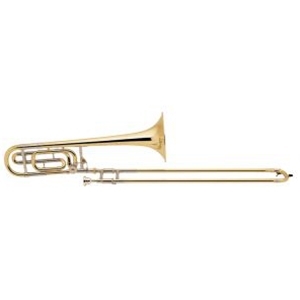 The Bach Stradivarius 42B professional trombone is ideal for both symphonic and solo performance. It features an 8-1/2" one-piece hand-hammered yellow brass bell that has defined the symphonic sound for generations. The .547" large bore combined with the traditional wrap F attachment offers outstanding clarity and projection with just the right amount of resistance. The chrome plated nickel silver inner handslide tubes provide the ideal surface for smooth and quick handslide action. The clear lacquer finish adds a subtle warmth to the sound overall. A case and a Bach 6 1/2 HA mouthpiece are included. This item is subject to a shipping surcharge. The shipping surcharge will be included in the total shown during checkout regardless of the shipping method you selected. However, it will only be charged if your order is shipped via USPS/UPS.